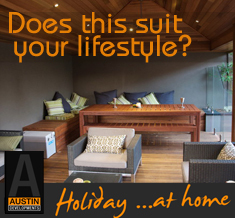 Austin Developments are Perthâ€™s outdoor living and designer timber lifestyle artisans. Your home is your greatest investment and we help you make the most of Perthâ€™s Mediterranean climate with our range of custom “Holiday at Home” pergola, patio, alfresco, cabana, Bali hut and timber decking designs. Our innovative and unique concepts combine function, comfort and style. With your ideas and our expertise we create unique outdoor lifestyles with every design. Professionally projected managed from initial design to handover with a focus and detail we pride ourselves on our innovation, quality and commitment to exceeding our customersâ€™ expectations. We employ our own qualified tradesmen not contractors and our range of services extends to timber construction and hardscape landscaping, including retaining walls, stone cladding, paving, concrete and timber decking. With over 15 years experience creating outdoor living spaces in a diverse range of unique and exciting building materials including local and imported timber, thatching, bamboo, stone Colorbond and tiles, Austin Developments are Perth’s trusted specialists in outdoor construction. Why Choose Austin Developments ? Whether you are looking to create more room with a patio or pergola, or a special outdoor living space with an alfresco, gazebo, Bali hut or new timber deck, an artisan design from award winning Austin Developments will enhance your outdoor lifestyle, improve your homes resale value and make your home the envy of the street no matter how challenging the area or shape.